US - There’s not a lot of mystery as to why hog prices are weak: There are LOTS of hogs out there! What is more, the price impacts are pretty much on line with those supply gains. No one wants to hear that, but let’s investigate, writes Steve Meyer in the National Hog Farmer. Last week’s FI slaughter run was 2.14 million head, 13.5 per cent more than last year’s porcine epidemic diarrhea virus-shortened 1.886 million. It was also 9.8 per cent higher than the same week in 2013. The big week comes on the heals of two other big weeks that have exceeded year-ago levels by 10 per cent or more and 16 weeks (since March 1) over which slaughter has averaged 9.1 per cent higher than last year and 3.1 per cent higher than in 2013. Those kinds of increases are going to leave a mark. The mark is prices that have run 30-35 per cent lower than last year. That multiple of 2.5 to 3 fits reasonably well with what we know about the elasticity of hog demand. See last week’s Weekly Preview for some details but I use a price flexibility of -2 to -3 (or an elasticity of demand of -0.5 to -0.3) to compute the prices expected for a given level of output. It’s clear that the prices we are witnessing are right in line with what we would expect. Weights have helped the supply situation somewhat and last week’s decline was perhaps indicative of a “sell ‘em now!” attitude among producers. Since April 1, the average weight of producer-sold barrows and gilts has been 212.2 pounds, carcass weight, 1.9 per cent lower than one year ago. Those 2014 weights were, of course, pushed higher by the need of packers for more pounds and by producers looking for higher prices in an uptrending market. This year’s decline is driven by just the opposite. Packers don’t need the bigger hogs though they certainly like them as long as they are lean. Producers are seeing a down-trending market and see little reason to feed hogs longer, thus that past few weeks’ higher slaughter and lower weights as producers dip deeper into finishing barns. It happened back in January and February and is happening again now. The cutout is down roughly the same as are hog prices. Last week’s value of $84.55 was down less than 1.8 per cent from the previous week, but was 32.8 per cent lower than one year ago. Hams are still the biggest drag on that value (-49 per cent from 2014) but gained $1.27 (2.2 per cent ) for the week. 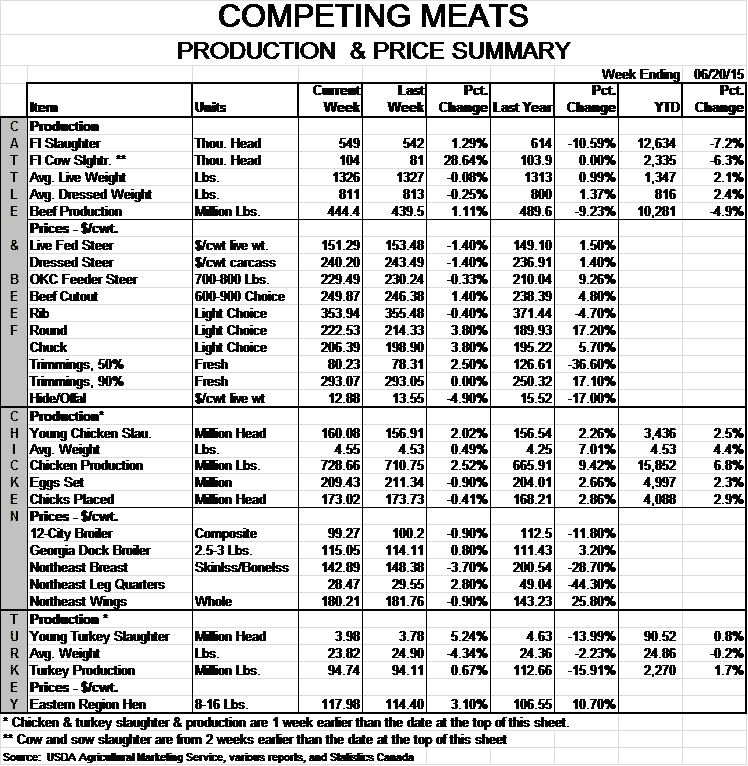 While loins have not provided the level of seasonal support for the cutout value that they normally do, they are closer to year-ago levels than are the other major cuts show in our Production and Price Summary table. In total, the price changes for wholesale cuts are, once again, “reasonable” in light of supply increases. 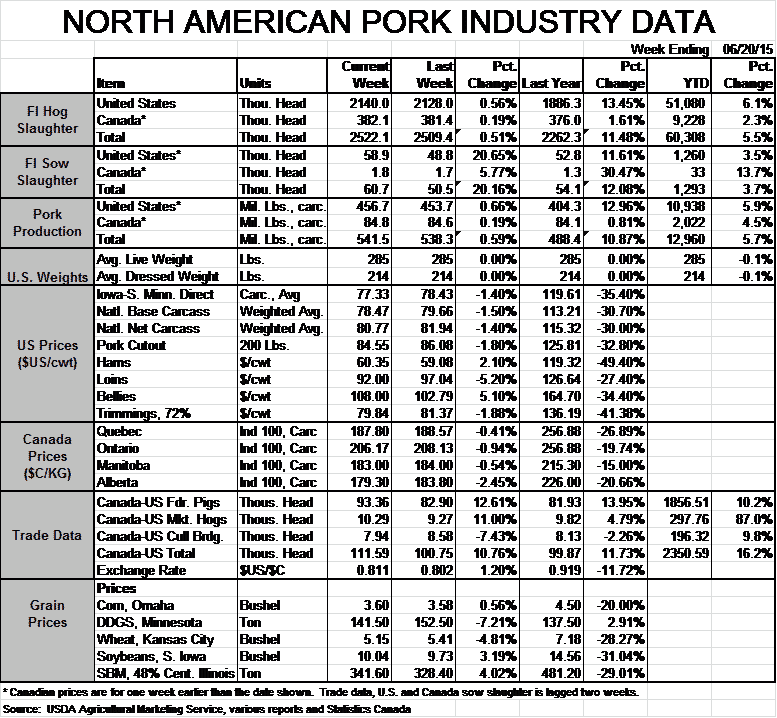 The big question is where production is headed the rest of this year and next, and we will get a read on that question this Friday when the USDA’s quarterly Hogs and Pigs report is published. The December-February pig crop was pegged in the March report at +9.2 per cent from one year ago. Those animals will be harvested generally from June through August. The March report indicated farrowings for March-May would be 2.1 per cent larger and our calculations indicate that a “normal” quarterly seasonal change in litter size would put that figure at 10.32 pigs per litter, 5.7 per cent higher than one year ago. That would put September-November pig numbers up over 7 per cent. We think December numbers, though large, will be pretty close to last year’s level since we think the USDA’s -2.1 per cent farrowings figure for June-August was actually reasonable give the number of sows that got bunched up in June-August 2014. However, these are the kind of market herd numbers I expect in Friday’s report. The sow herd will almost certainly be larger. My discussions at World Pork Expo indicated substantial expansion is underway with numbers from 150,000 to 250,000 additional sows common. Replacement (or expansion) gilts are hard to find before mid-2016. The midpoint of those expansion estimates would indicate growth of 3.4 per cent from last year’s 5.855 million head. I would be surprised to see all of that growth in this report, but the breeding herd is almost certainly headed for 6 million-plus over the next 18 months and productivity is once again growing sharply. The supply wild card remains PEDV and no one, to my knowledge, has a very good prediction of how severe it might be this winter. If losses are similar to this past winter, supplies will be ample to say the least in 2016.